"Quick high protein breakfast. Since this is for breakfast and I'm usually hungry, I will have 2 skillets cooking the crepes at the same time." Whisk flour, milk, egg whites, olive oil, and cinnamon together in a large bowl until batter is smooth. Lightly spray a skillet with cooking spray and set over medium heat. Pour 1/4 cup batter into the skillet and rotate skillet so batter spreads to the edges in a thin layer. Cook until bottom is lightly browned, about 2 minutes. Flip and cook other side until bottom is lightly browned, about 2 more minutes. Repeat with remaining batter. Mix Greek yogurt and jelly together in a bowl. 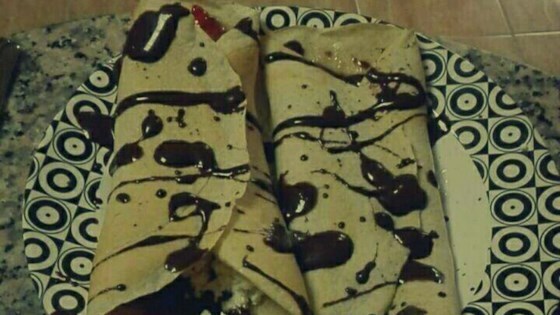 Spoon a layer of yogurt mixture onto each crepe; roll crepe around filling. Place rolled crepes on serving plates and top with remaining yogurt mixture. Sprinkle each crepe with cinnamon. I think it's weird it only has 1 review. It's quite good, delicious, and very easy to make! These turned out great. Nice texture & loved the cinnamon. I substituted coconut milk and topped with honey for a little extra flavor.